I am an embroidery artist, originally from the North Yorkshire coast who works from my home studio in Leeds. My original textiles are a bold and tactile exploration of colour and pattern through hand stitching and embellishment. I use a combination of processes within all of my embroideries including traditional hand embroidery techniques, hand dyeing, printing and embellished surfaces – that utilise unconventional materials. 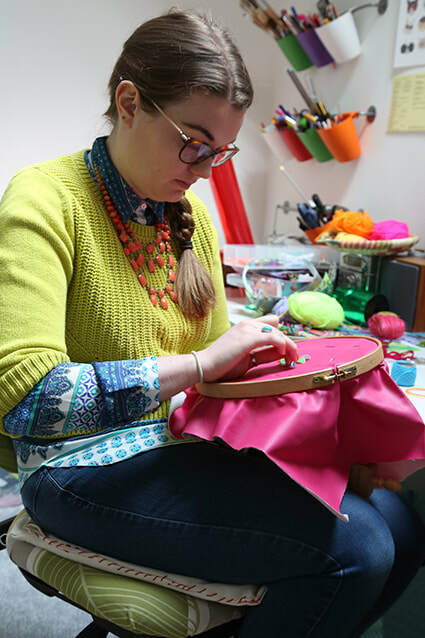 I'm passionate about utilising mixed media and recycled materials such as painted metal washers, hand dyed plastic cotton buds, dyed sponges and stripped electric cables within my hand embroidery work. These materials are transformed and manipulated to create intricate embellishments. This juxtaposition of unusual media with traditional techniques invites the viewer to look closer – creating curiosity. I started creating my own sequins and beads during my textiles degree. I found that by manipulating old packaging and utilising different materials such as metals and foams - I could create embellishments that were highly tactile and creative. This streak of experimentation has continued to influence and enhance my work ever since - and I don't think I will ever run out of new ideas for unusual materials that I can stitch onto my fabrics! All of my textiles showcase meticulous hand stitching and intricate detailing. Each single stitch provides an added element of texture and colour to the work as a whole. Colour is an important aspect within my work – I use many strong and highly contrasting colours, creating a very vivid and saturated colour palette. My artworks are a textural and visual feast, saturating the senses with colour and pattern. In 2018 I was awarded the under 30's Scholar by the Embroiderers Guild, and also became a member of renown textiles group - Prism. If you have any questions about my work or would like any information regarding pieces for sale or individual requests or commissions, I would be very happy to receive them - so please don't hesitate to contact me. I am also available for talks and workshops, please get in touch for more information. Subscribe to my monthly newsletter for events, workshops and news!